Welcome to another Becoming A Modern Man! 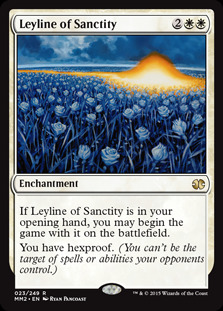 In this article, I will be looking at the Selesnya Value deck for lack of a better name. The deck was popularised by Todd Stevens on the SCG Modern Tournament scene and is a very innovative take on a Selesnya creature deck. The decklist is from an article by Craig Wescoe that helped me a lot in learning how to play this deck. The article and videos helped me pick up on some of the less obvious interactions within the deck. I highly recommend checking that article out if you are interested in playing this deck. 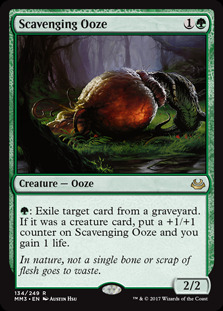 Our one-mana ramp creatures are important to us for hitting our three-drops nice and early. 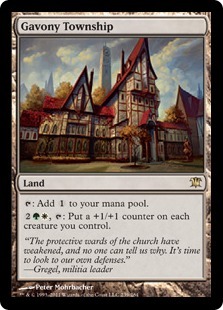 A Turn 2 Knight of the Reliquary is just the kind of opening this deck is looking for and with the three-mana slot being so heavy in this deck our mana producers do a lot of work. Voice is a great value card. If it dies it provides you with a token and if your opponent wants to play an instant spell then they will also give you a token. 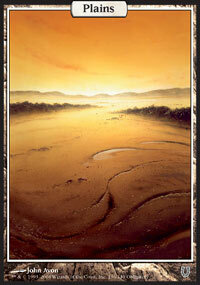 Control decks are quite popular in Modern at the moment which makes Voice all the more powerful. Knight is a key card for the deck and one of its most powerful. Arguably this is the deck that puts Knight's considerable talents. There are a lot of great combinations and synergies within the deck that work perfectly with Knight. 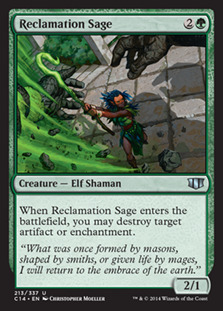 Ramunap Excavator allows you to recast the lands you sacrifice to Knight. 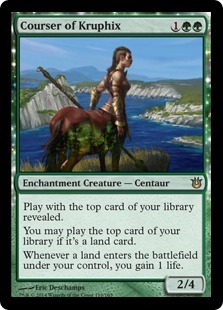 Courser of Kruphix gains you life from the lands as they come into play and you can use the shuffle from Knight's ability to manipulate the top of your library. 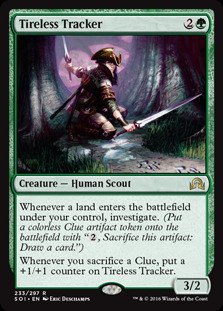 Tireless Tracker creates additional clues from the extra lands. 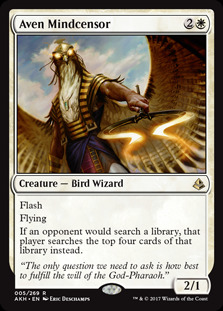 Courser is a great body that gives you value by allowing you to cast lands off the top of your library and also seeing what is on top of your library. There are a lot of shuffle effects in this deck so you are able to manipulate the top of your library quite well until you find a desirable draw. 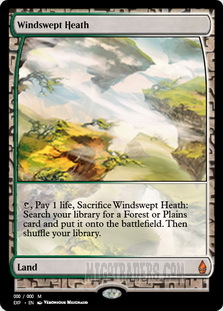 We can also draw extra cards with Horizon Canopy or Clues generated by Tireless Tracker to clear cards off the top to find a land to cast. The lifegain element is also important to mention. 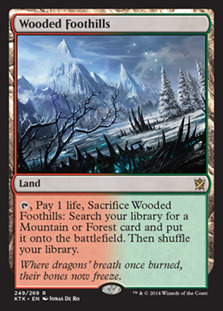 It may seem fairly insignificant but this deck has a lot of ways to ensure it is dropping a land into play each turn. As such the lifegain is substantial and I have had a lot of games where multiple Coursers have helped me draw out the game into a winning position from what seemed like a potential loss. 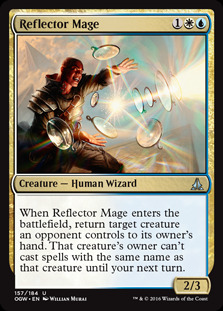 Tireless Tracker is a card I have become increasingly impressed with in Modern. 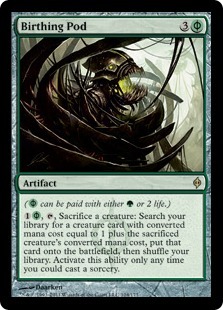 It generates great value off of your land drops by creating clues and also becomes a growing threat as you sacrifice those clues for extra card draw. If Tracker can stay on the board it generates a huge long-term advantage which is very tough to beat. Excavator works very nicely in this deck. 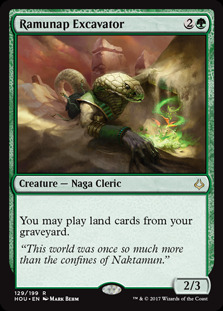 Excavator allows us to reuse lands from our graveyard, getting extra triggers for our Courser of Kruphix and Tireless Tracker etc, and also letting us reuse our utility lands like Ghost Quarter and Horizon Canopy . 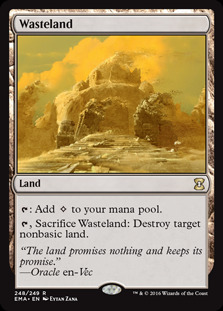 You can draw an exrtra land each turn with Canopy or repeatedly Ghost Quarter your opponent until you are Wasteland ing them. 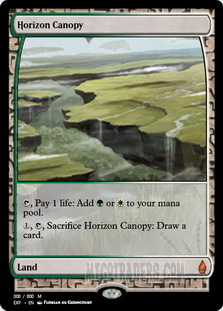 Azusa allows you to ramp if you have enough lands in hand and also combos formidably with Ramunap Excavator . With Azusa and Excavator you can Ghost Quarter thrice a turn or draw 3 cards from a single Horizon Canopy . 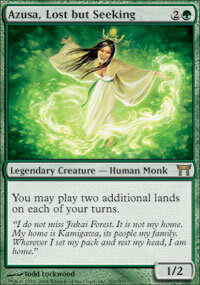 Personally, I would say that Azusa is one of the more expendable cards in the deck and one I frequently sideboard out. I might be wrong but for me it's a bit of a win more card rather than an essential part of the deck. It does some cool things but it's rare you are using it as mana ramp and without an Excavator on board Azusa's size makes her a poor addition to the board. A classic Collected Company staple but we can only find room for a one-of in this deck. 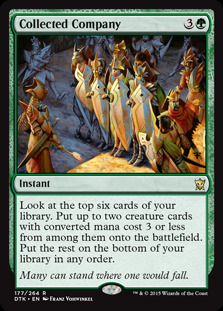 It's possible the deck could run more Witnesses but the 3-drop slot is pretty crammed in this deck so it would be hard to make room. Being able to recur your removal or a Collected Company with Eternal Witness can be extremely useful. One of the more bizarre choices for the deck but it is another useful 3-drop and can help with some of our weaker matchups. 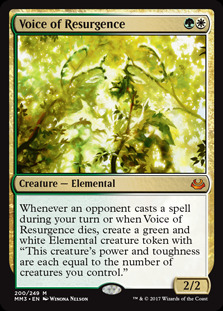 Also, it helps to have an additional evasive creature in the deck as the long games this deck plays for can get quite grindy. The best removal spell in our colours. The deck is otherwise very light on removal so these four copies of Path to Exile are essential to letting us disrupt our opponent when necessary. This card does not really need any introduction at this point. Collected Company is a 4-mana instant that can let you drop two creatures into play which is pretty huge. 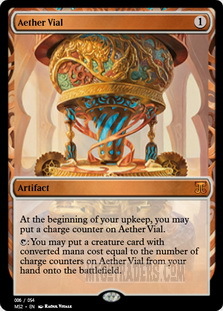 An interesting discussion arose around the Five-Colour Humans deck about what decks are AEther Vial decks and which are Collected Company decks. The answer largely surrounds the density of 3-drops compared to 2-drops. Humans is 2-drop heavy whereas Selesnya Value is 3-drop heavy meaning we are likely to get better value from a Collected Company . As I have mentioned there are a number of great combinations in the deck and so Collected Company helps put those creatures onto the battlefield at the same time. 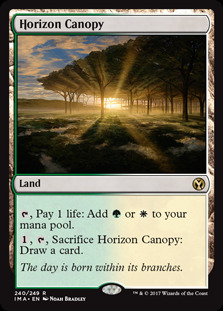 Canopy is a dual land in our colours and one that we can cash in for a card when the time calls for it. We can tutor it up with Knight of the Reliquary and cast it from the graveyard with Excavator. 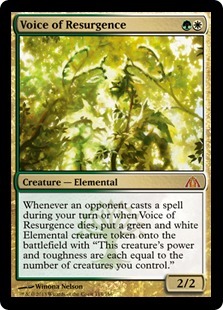 Also, Courser of Kruphix allows us to see the top card of our deck which means we can make more informed decisions about when to sacrifice our Canopy. Ghost Quarter is one of the most powerful non-basic hate cards in the Modern format. It's much fairer than Wasteland but still very powerful. This deck can really abuse Ghost Quarter , being able to tutor it with Knight of the Reliquary and recur it from the graveyard with Ramunap Excavator . Township is a great land that hasn't seen much play since Birthing Pod decks were hit with the ban hammer. Over the long-term it makes your team outsize your opponent's and very difficult to deal with. As we only have limited evasive creatures it makes sure we can break groundstalls. 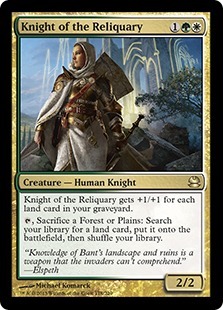 It can be tutored up with Knight of the Reliquary so we only really need one and we can get it back from the graveyard if it is destroyed with Ramunap Excavator . 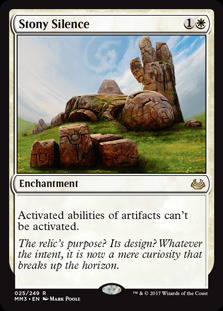 Stony Silence is a powerful artifact hate card that particularly helps out in the Affinity and Tron matchups. 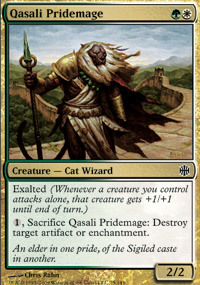 Nature's Claim , Qasali Pridemage and Reclamation Sage provide a powerful artifact hate suite but also can destroy problematic enchantments like Blood Moon or Auras from Bogles. 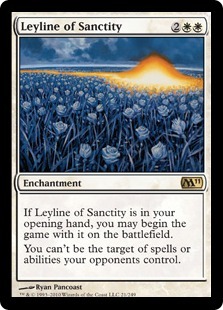 Leyline of Sanctity is a great card against Burn and Storm decks, cutting them off their primary method of winning the game. 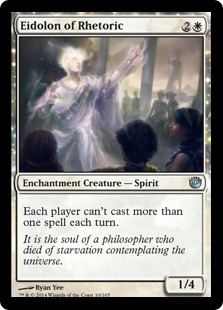 Eidolon of Rhetoric is another three-drop that hates on Storm and various other combo decks and can also be put into play with Collected Company . Surgical Extraction provides us with graveyard hate for decks like Storm and Dredge. 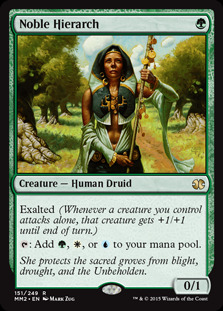 Elspeth, Sun's Champion is a good way to go big as some decks just don't really have an answer to her. She can wipe a board of huge creatures or creature an army of 1/1s. 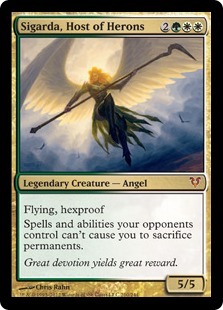 I like bringing in Elspeth against Control decks as a top-end threat that they might not see coming. 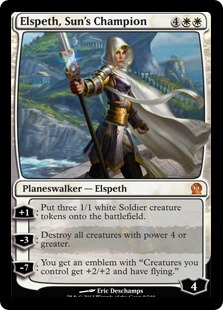 Elspeth is also nice against Death's Shadow and similar decks that struggle to deal with the tokens she generates. 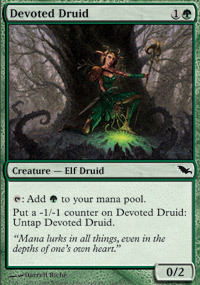 Linvala, Keeper of Silence turns off the Collected Company combos with Devoted Druid , Elf decks and also does a number on a lot of Affinity's creatures. 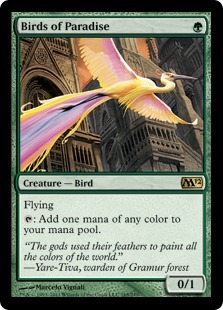 Sigarda, Host of Herons is a big flyer that also turns over Liliana of the Veil and All Is Dust . 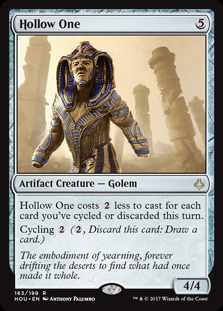 It is a tough creature to deal with but it is not card that I have found myself sideboarding in during my play time. Not sure I would keep this in the sideboard. Our first matchup is against GB Tron. All being well this is one of the decks we are looking to prey on. 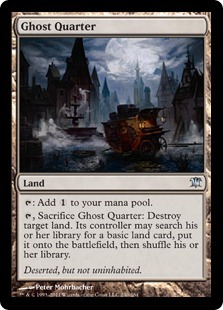 We have four main deck Ghost Quarter s, Knight of the Reliquary to tutor them up and cards like Ramunap Excavator that can allow us to recur them. 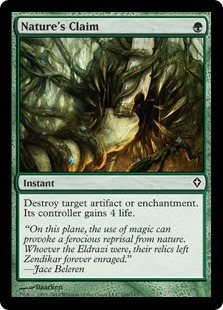 Post-board we can bring in our artifact hate which should hopefully make this a solid matchup for our deck. Our second matchup is against Rakdos Hollow One. Game 1 of this matchup features an insane comeback that is well worth checking out. The Hollow One deck can produce fairly terrifying boards very quickly with a good hand. Fortunately, we can produce pretty great boards ourselves but we do need to make sure they do not run away with the game too swiftly. Our third matchup is against Merfolk. This match was really interesting. The deck can struggle against fast creature decks but here we were able to stablise and actually outdo the Merfolk deck. Note that you can Ghost Quarter your lands that have been hit with Spreading Seas to prevent islandwalk. Our fourth matchup is against Five-Colour Humans. This matchup is rough as cards like Reflector Mage punish us for being so 3-drop focused and our lack of removal means they can chain together huge boards. The deck is very versatile and can cause some headaches. The deck does, however, have an awkward manabase that we are vary capable of attacking given the opportunity. Our fifth matchup is against a Boros Death & Taxes deck. This matchup seems pretty favourable. Their hate, such as Thalia, isn't very effective against us as we are heavily creature-focused. 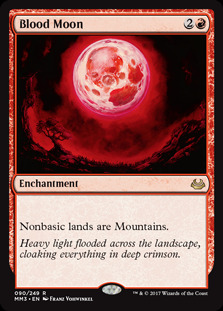 Search hate is a pain for our fetchlands and Knight of the Reliquary but not game breaking thanks to our mana dorks and high number of basic lands. 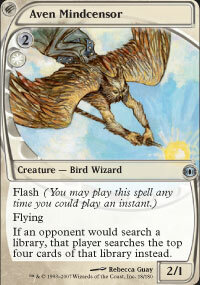 We also have some good creatures against them like Courser of Kruphix is a good blocker against most of their threats. The real risk if being caught out by their flyers which we can make up for somewhat with our sideboard. I really enjoyed playing this deck. It plays a lot more like a Control deck than your standard Selesyna deck but does it in a very different way to a Blue Control deck. The deck is all about value and has ridiculous combinations that help you lockdown the long game. The deck certainly has its weaknesses, primarily in the form of fast aggro decks and combo decks due to our lack of removal, but it's fairly versatile. 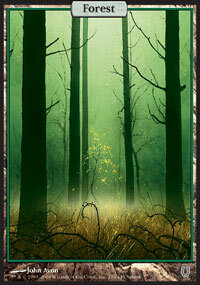 The deck is tricky to learn and very decision heavy but rewarding at the same time. I would highly recommend this deck for Control fans who want to do something a bit different.